Our captivating landscape inspired seminar series has drawn to an end. We’re delighted the series has been so well attended; a testament to the speakers and to the fascinating subject matter. If you attended any of the talks (or were unable to) and want to find out more, you can get in touch with us by emailing merl@reading.ac.uk. and landscape architect Annabel Downs gave an insightful overview of the history of the Landscape Institute and to the collections here at MERL. Our Landscape Institute webpages are a really useful starting point for research into our collections and as a source of background information and handlists for specific collections, such as the Brenda Colvin collection, Geoffrey Jellicoe collection and Preben Jakobsen collection (which Karen Fitzsimon used in her talk entitled ‘Rediscovering Preben Jakobsen’. 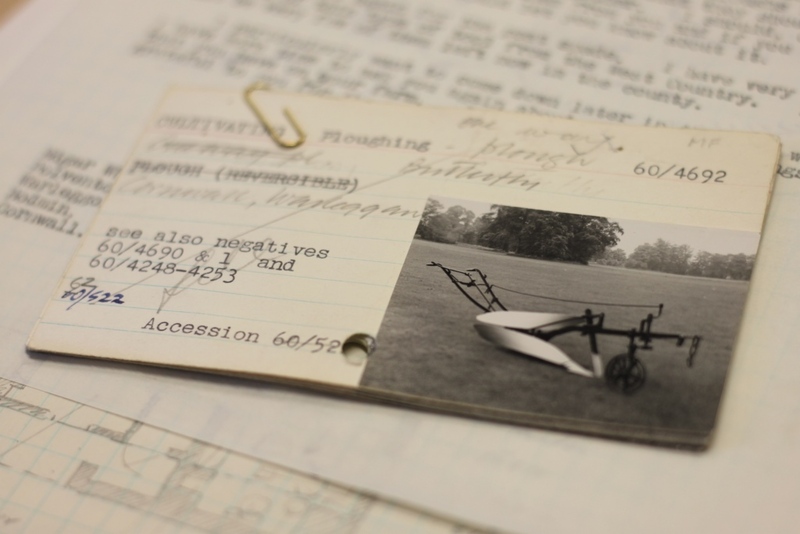 Our existing MERL archival holdings also hold many treasures to the student of landscape. 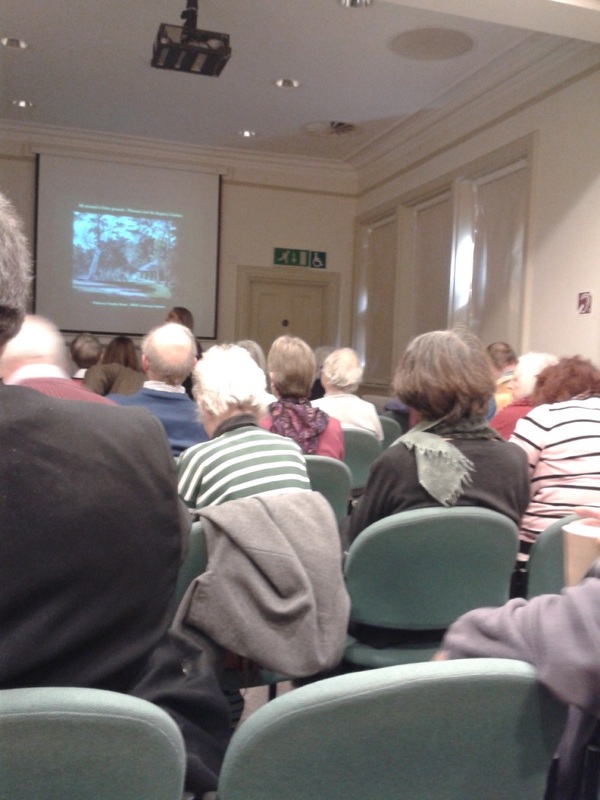 Johnathan Brown, in his talk entitled ‘Changing landscapes of farming and estates after the First World War’, used several images from the extensive MERL photographic collection to great effect. 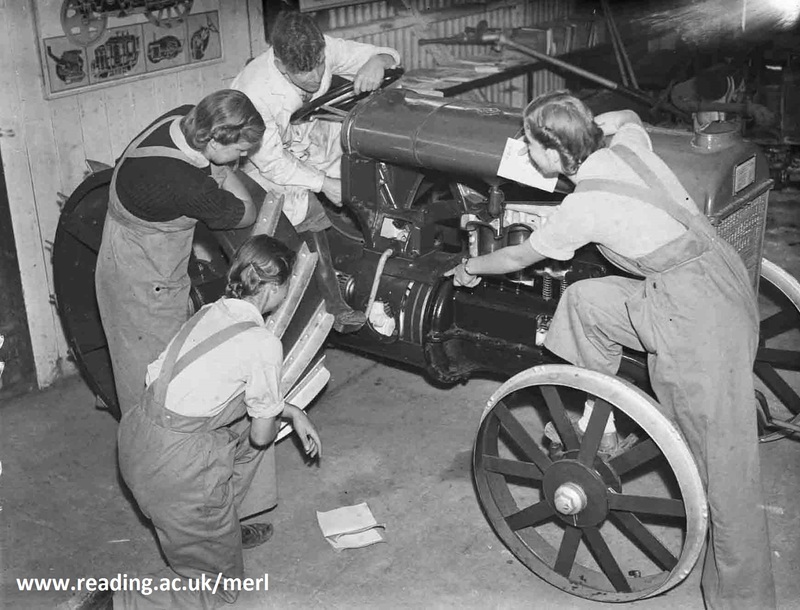 A full listing of our existing MERL archives can be viewed using the MERL archives A-Z. 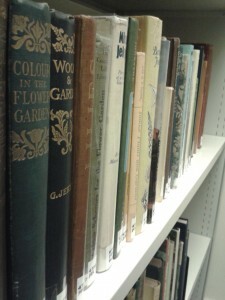 The library of the Landscape Institute is being integrated into our existing MERL library, further adding to areas of strength within the collection, on subjects such as domestic gardening, land use and the environment and conservation issues. 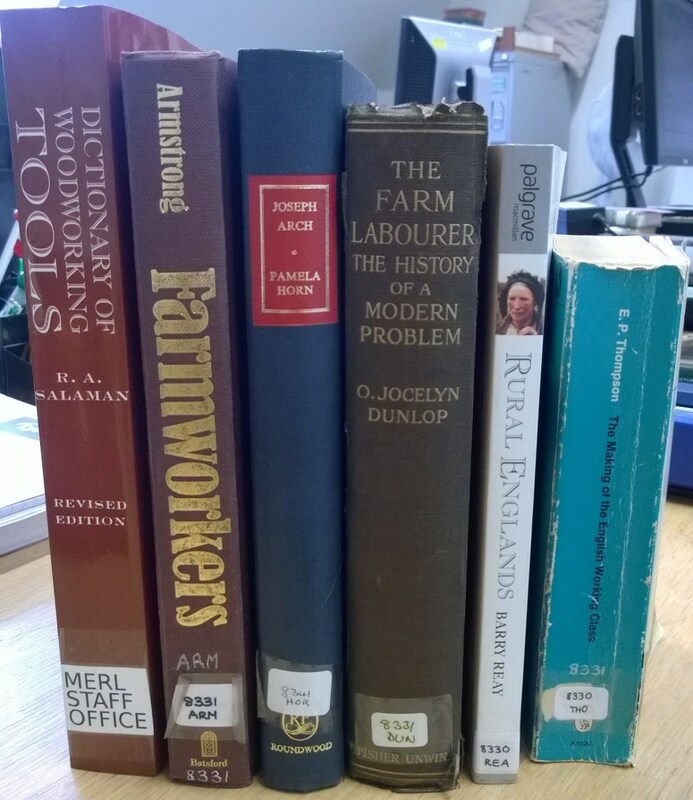 Reference books within the MERL library are a great place to start research into all things landscape. We were able to show case our Gertrude Jekyll books in a pop up exhibition following Richard Bisgrove’s talk such as Gardens for Small Country Houses, Colour in the Flower Garden and Home and Garden. 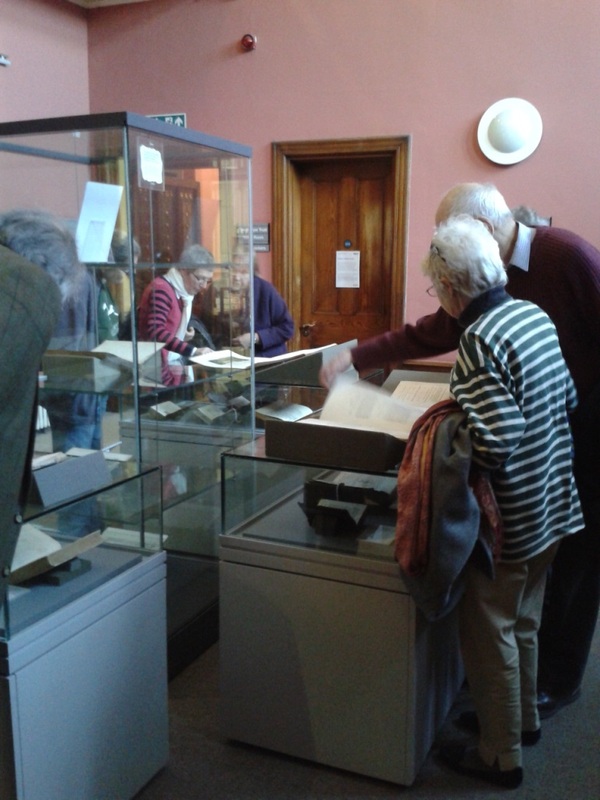 The talk from Giles Pritchard and Barnaby Wheeler entitled ‘Reading Abbey Revealed’ was another perfect opportunity for us to delve into our Special Collections and display some of our rare books relating to Reading Abbey. We were also to display images from slides from the Moore Piet + Brookes collection relating to their work on the Reading Town Centre Masterplan and pedestrianisation. 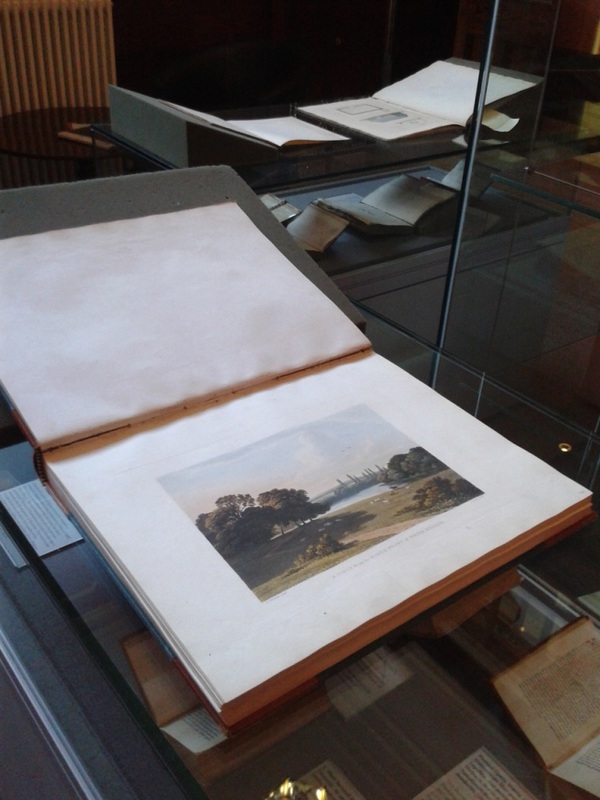 The pictures below from Professor Timothy Mowl’s intriguing talk on ‘Pleasure and the Regency Garden’ enabled us to showcase some wonderful books featuring beautiful plates of the gardens at our very own Whiteknights (such as Hofland’s A descriptive account of the mansion and gardens of White-knights). As above for more information please contact us on merl@reading.ac.uk, visit our LI webpages or search our online catalogue. To continue discovering the landscape, FOLAR (Friends of the Landscape Library and Archive at Reading) are holding a study day on Brenda Colvin (with a talk from Hal Moggridge, our archivists and a pop up exhibition) at MERL on Saturday 21 March. See here for more information or contact folar1234@gmail.com to book. 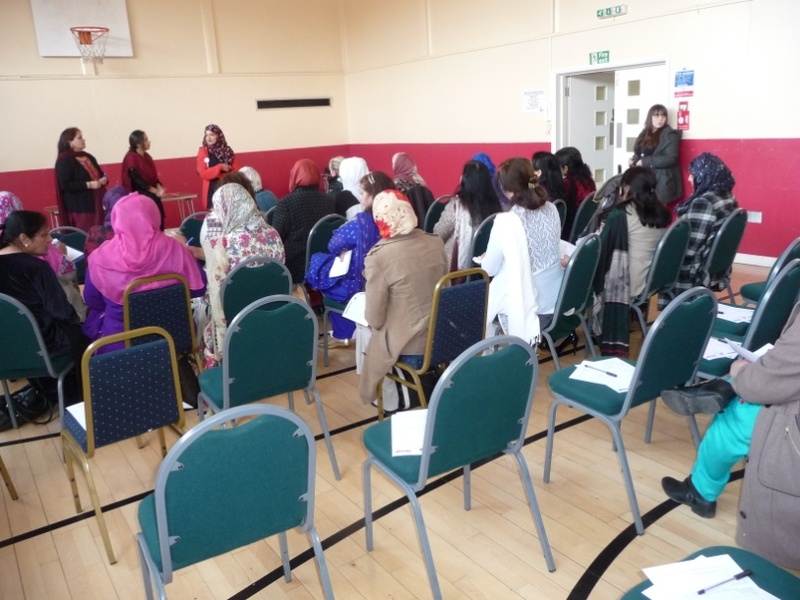 Aman Group is a women’s only community group who meet at Manor Park Community Centre in Slough to learn from each other in friendship and participate in exercise, awareness sessions, health and beauty ideas and much more. 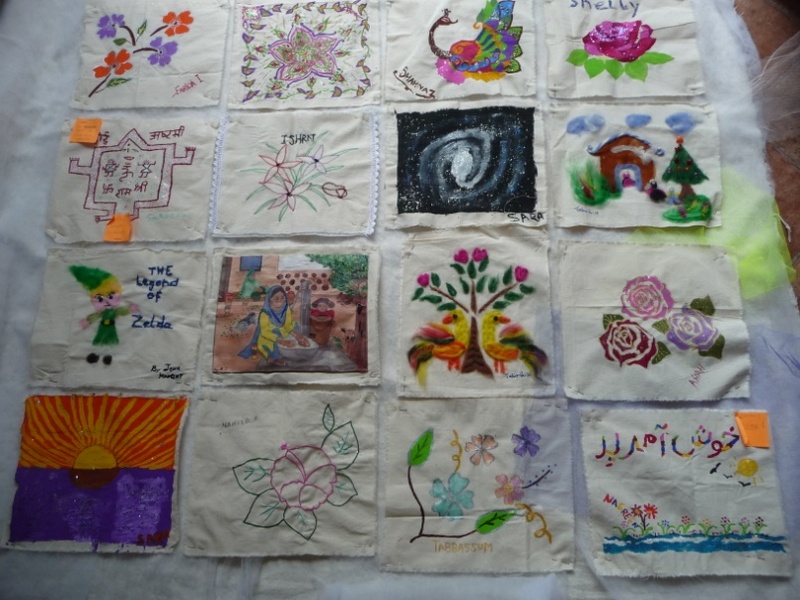 In 2014, Sloughroots ‘Remedies-Remembered’ participants from the Aman Group got involved in a Quilt Project when they visited Museum of English Rural Life, and made 20 art panels reflecting feelings, colours, cultures, interests and values of the participants. 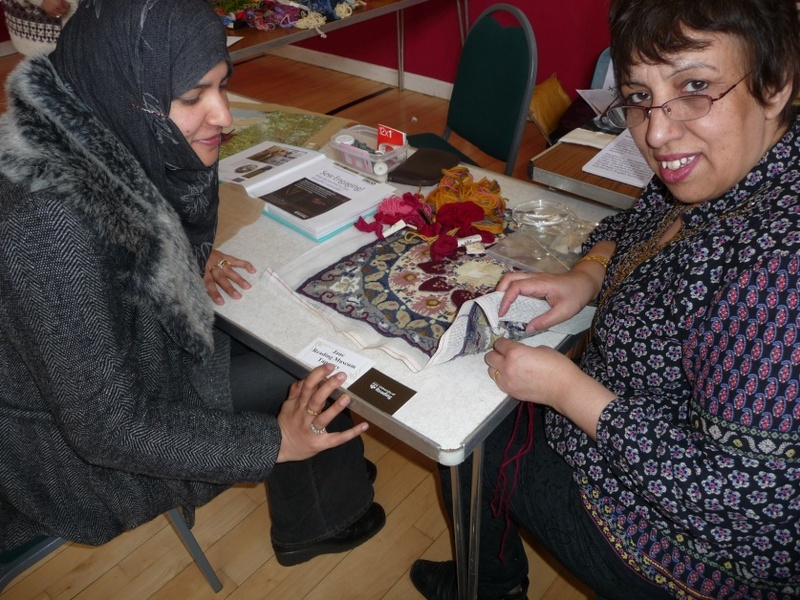 In March 2015, Aman Group, in partnership with Slough Borough Council, held an open morning, to discuss ideas for future sessions, and the ‘Sew Engaging’ project was on their list. ‘Please be here to set up your stall at 10.30’, they suggested, so I caught the village bus, taking the quilt and a suitcase of sewing supplies. Public transport doesn’t ‘connect up’ for rural commuters, one of the things we ‘hate’ about living in the country, but the M4 was grid-locked, due to an accident. I spent an hour waiting for the 0911 train, which was packed. ‘I thought you did well to get off at Reading,’ the Dispatcher said, grinning at my packages, but I caught the Slough shuttle and a friendly face met me at the station, ‘Welcome back’. The ladies were gathering in the Gymnasium, ‘Lovely to see you again! Are you coming every week to teach us sewing?’ The up-cycled needlework kit I had sent them was still in the envelope, but it wasn’t long before some of the women drifted towards my table. Soon more volunteers begin work on the unfinished ‘Butterfly’ canvas, eager to brighten up the muted blues and pinks of the floral cushion cover with gold thread and bead work. 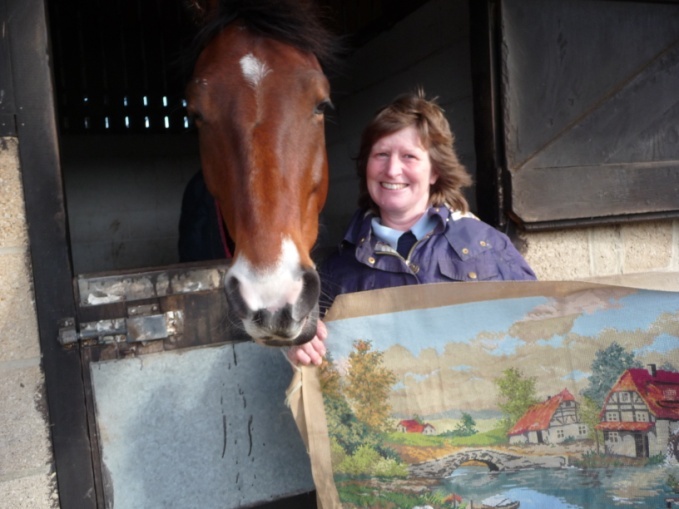 This panel will be part of the ‘triptych’ showing things people love about the countryside. Other panels have been sent to the Chinese Women’s Group in Reading and the Powys Federation of Women’s Institutes, for their interpretation. Next time, Jane visits Pennyhooks Care Farm near Oxford, and works with students who have Autistic Spectrum Disorder. We’ve all been very busy researching nine new galleries for the Our Country Lives redevelopment, covering everything from wagon construction to rural fashion. What caught our eye recently, however, was a one-way, horse-drawn Butterfly plough. While delving into our accession files for its measurements we found this interesting little map tucked into a sheaf of correspondence (below). It depicts a working farm in Polventon, Cornwall where our plough came from. It shows a house, barn, stables, a waggon and cart hovel, a ‘new building’ and a chapel. It also has some queries – such as one building labelled ‘bullock house? Pigs?’. I doubt we’ll ever know which. The correspondence also revealed that the farmer used this horse-drawn plough to fill in the gaps which his tractor-drawn plough could not reach, such as by the hedges, showing the perseverance of old technology where practical. The curator has marked two X’s on the map where two ploughs were found in hedges (including the one in our collection). Not exactly buried treasure to most people, but valuable to us nonetheless. 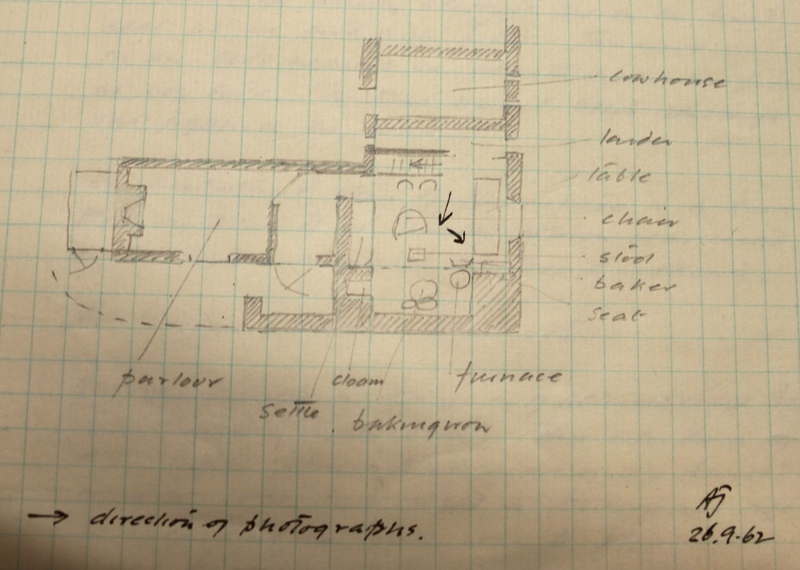 What is also particularly interesting for us is the inclusion of a floor-plan of the farmhouse (below), labeling familiar objects in our collection such as settles. 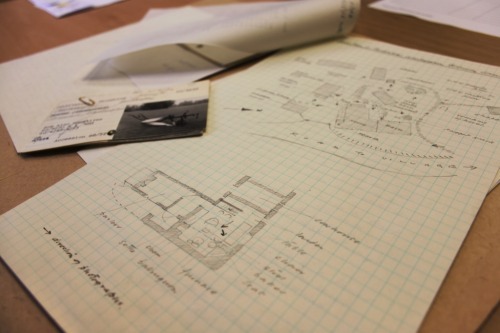 Considering our plans for the redeveloped galleries include a focus on ‘Hearth and Home’, exploring both the romanticised view of the cottage and the too-often grim reality, these plans may well shape our interpretation and object layout. The farmhouse still exists in the exact same shape, although the ‘waggon hovel’ has since been converted into a garage. No longer used as part of a farm, you can rent out the house for a self-catering holiday, which is itself an interesting comment on the changes in farming and rural real estate over the past fifty years. Hopefully we’ll have more interesting things crop up as we research over the next few weeks! 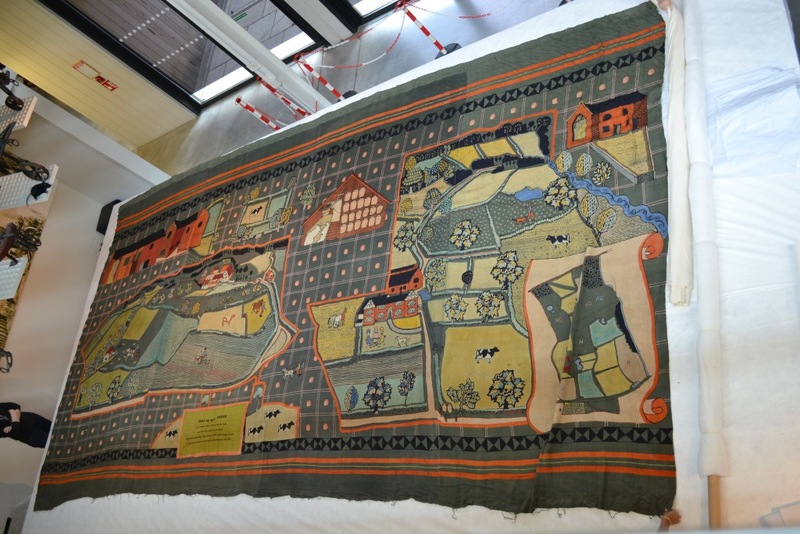 To celebrate International Women’s Day, University of Reading student Dylan Doran has been exploring the collection of Women’s Land Army objects here at the Museum. The Women’s Land Army (WLA) was created in 1915 to help farmers cope with the shortage of male labour as a result of the First World War. It was brought back into action for the Second World War, at first on a voluntary basis before conscription was enforced. Although many women in the WLA already lived in the countryside, many came from urban centres. A leather notebook used by Land Girl Doreen Thorp (MERL/88/66). The 20th century saw great strides in equality of the sexes, and one of the ways in which British women made further steps towards emancipation is undoubtedly their efforts in the Women’s Land Army. Skeptics did not believe that women would be suited to the hard labour involved in farmwork, but the Army of 65,000 Land Girls went on to produce the majority of Britain’s food by 1943, happily proved the critics wrong. The women took to farmwork with speed and skill. 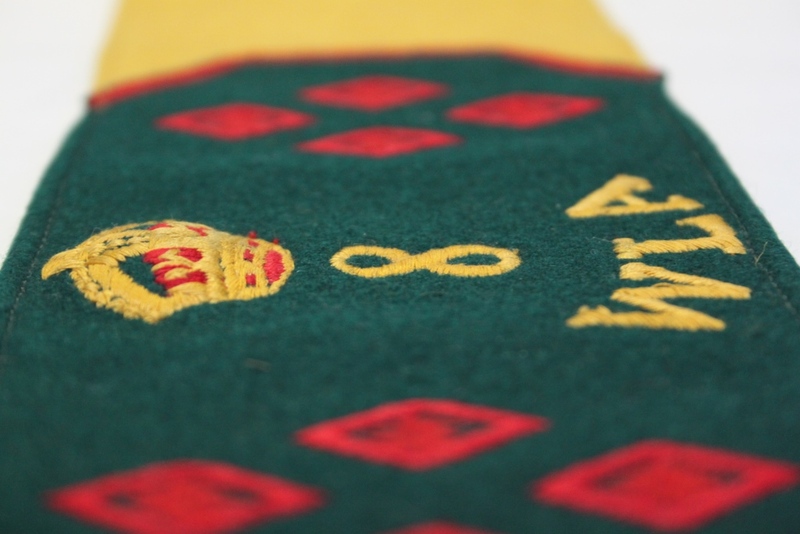 This Golden arm-band was awarded by the Queen herself to a Land Girl for her impressive years of service, having joined up from the Land Army’s beginning – when she was only sixteen years of age – and stayed working on the land until the Women’s Land Army disbanded. During February half term we invited families to see how the museum has changed since we closed and to find out about our plans. Alison Hilton, Marketing Officer explains how the family forum events were a great opportunity to try out some ideas for activities and get feedback from family visitors too. We didn’t realise quite how much we’ve missed our visitors since closing for redevelopment until we were able to welcome back some familiar faces during February half term. Some of our most frequent family visitors joined us for a Behind the Scenes family tour and for the first Family Forum meeting. 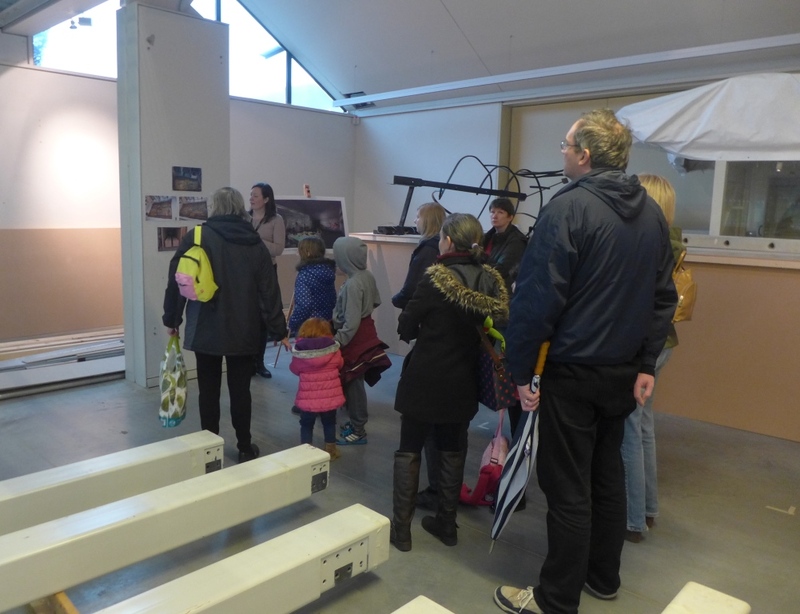 It was really exciting to be able to show these families the dramatic changes that have taken place in the Museum since October and to share our plans with them. As regular visitors, they were familiar with the museum, and so were interested to see what has been going on over the last few months: there’s the building work going on at the front and back of the museum; the wagons have come down from their pedestals; most of the objects are carefully stacked down one side of the museum behind huge plastic sheeting; and others are covered with dust sheets. 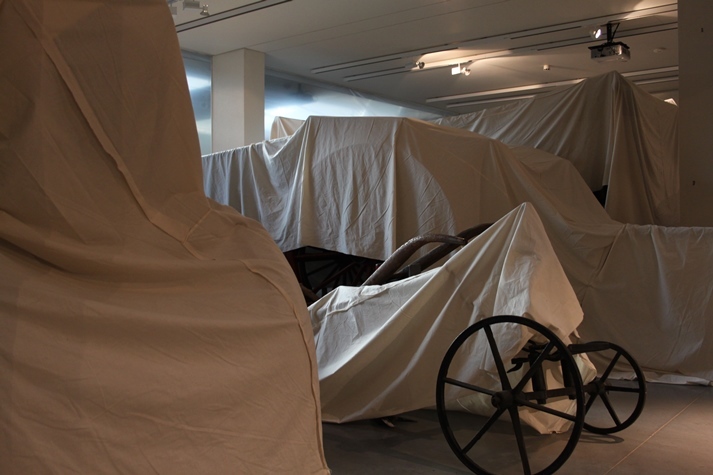 They were very good at guessing what was under each sheet – although it is hard to disguise a threshing machine! Some were surprised at how big the museum seems when cleared of objects whilst others couldn’t believe we’d ever got all those objects in! 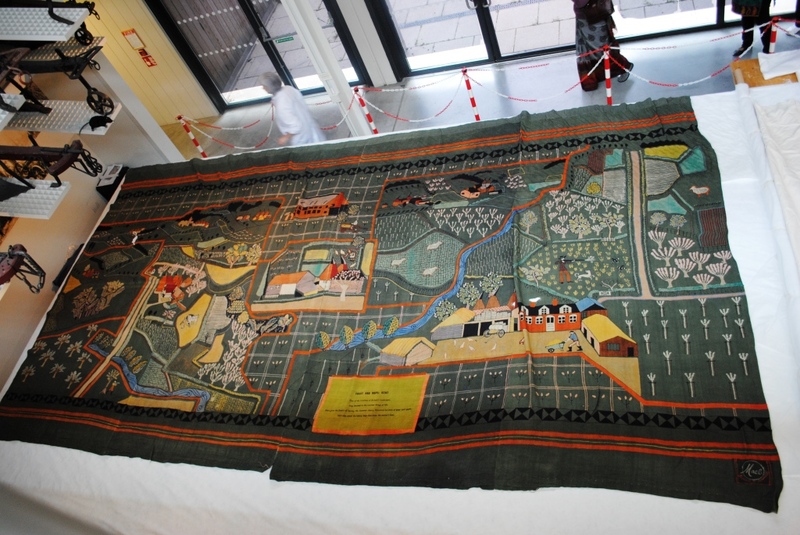 At the far end of the museum they were able to see where the new extension will be built to house one of the huge 1951Festival of Britain wall hangings and our conservator invited them to have their say on which one will be chosen to be displayed first – Kent or Cheshire? …or Kent to go on display first? Everyone had plenty of questions for us. 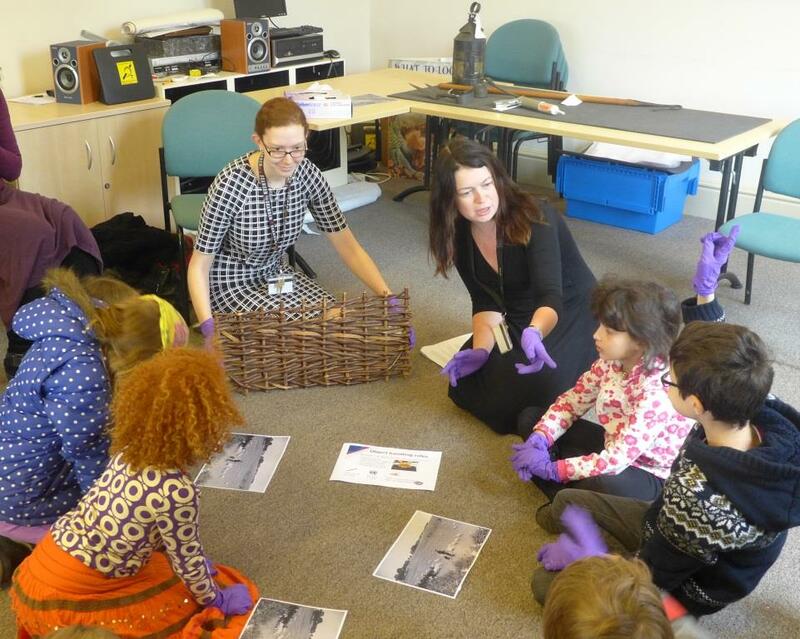 The children asked about their favourite objects and activities from the ‘old’ museum, such as the rat trail, dressing up and threshing machine model and the Speed the Plough film. We were able to reassure them that there will be lots of new dressing up opportunities and that we’re spending a lot of time at the moment planning exciting new interactives which will make visits to the new museum even more fun and interesting. The adults wanted to know how we were going to encourage children of all ages to stop, look and think about the objects, which lead to useful discussion about the new gallery themes and types of text and labels we are thinking about. 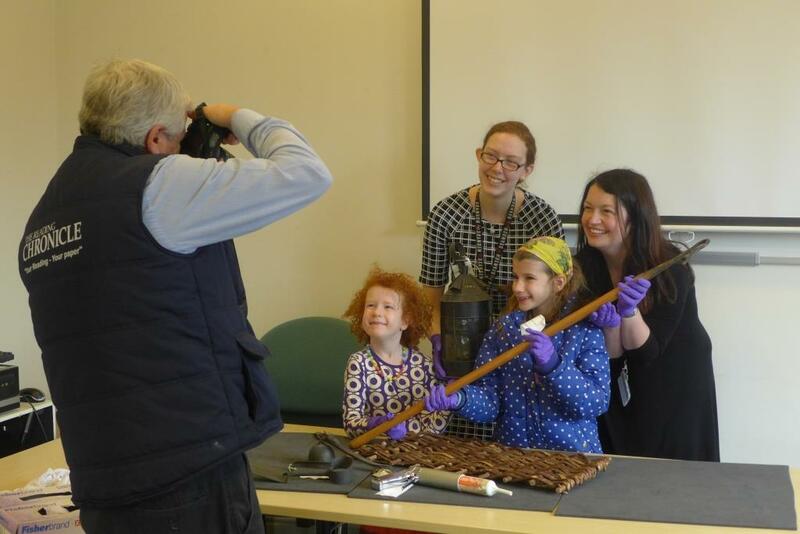 The half term events were designed to enable families to find out more about our project, but we also wanted the opportunity to listen to their feedback and test out one particular aspect of our plans, so after the gallery tour the families took part in an object handling session. We’ve planned a session based on objects relating to shepherding and lambing which we needed to try out, and we were amazed at the positive responses. They understood why we have to be careful with the objects, why you can’t usually touch all the things on display, and were so good at working out what the objects were we might have to choose more obscure objects in future! We also happy to have reporter Chris Forsey from the Reading Chronicle at the first event! You might have seen his article in the paper?! These were the first of our family forum sessions in which we will be testing more ideas and seeking feedback from regular visitors as well as those who are not familiar with the museum. If you’d like to be involved, please contact Danielle Eade. In this post Project Officer Felicity Williams explains how she has amassed huge amounts of specialist knowledge by reading some very obscure books in the name of research. 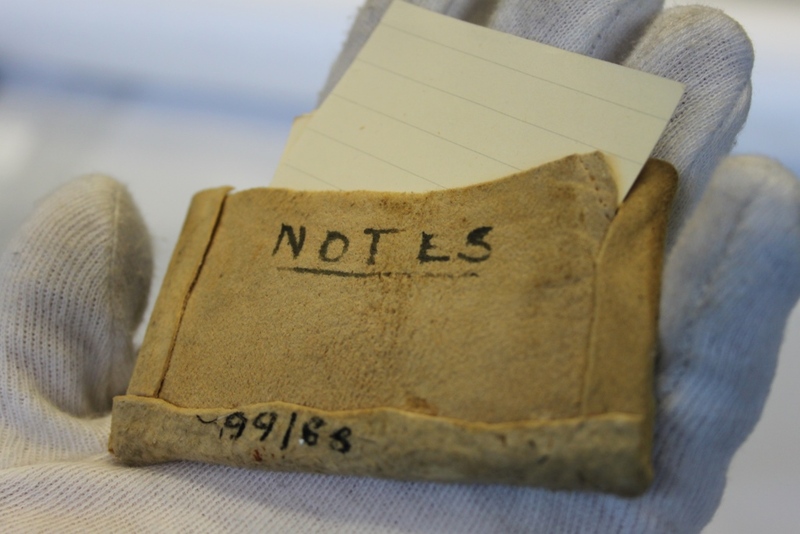 My work on the Our Country Lives museum redevelopment has involved a lot of research – using collections but also MERL’s wonderful archive and library. Apparently, in meetings I often start sentences with ‘I read an interesting book about…’ and follow it with a snippet about a bizarre or incredibly niche topic. I am eternally grateful for my ability to become fascinated by just about anything! To honour the fact that today is World Book Day, it has been suggested that I share with you just a small sample of some of the books I’ve been encountering over the past months. Some are listed because I thought they were brilliant, some because they surprised me, and some because they are about amusingly odd-sounding topics. Hopefully I’ll have further chances to share with you some of the great books and resources and stories I come across during my research. Dictionary of Woodworking Tools by R. A. Salaman – I can’t quite convey just how much I love this book. Salaman lists, illustrates and describes the types and sub-types of tools used in an enormous variety of woodworking crafts and trades. 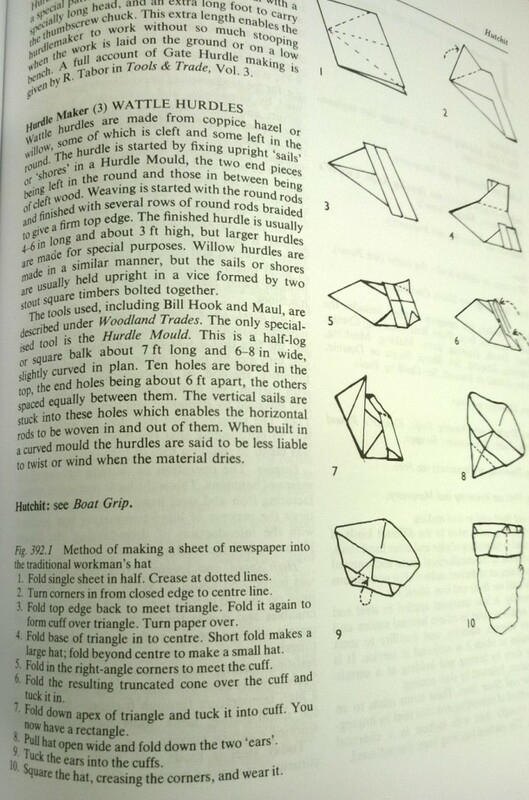 It’s an indispensable resource for anyone learning about woodworking crafts. And it contains instructions for how to make a paper hat. Trees and Woodland in the British Landscape by Oliver Rackham – if you can only read one book about the British countryside, I suggest you choose one of Professor Rackham’s. He writes about the natural and social history of landscape with an engaging enthusiasm and terrifying depth of knowledge. He made me challenge what I thought I knew about trees and woodland. Cannibalism and Feather Pecking in Poultry by MAFF – because apparently chicken glasses are a thing. Seriously – little red spectacles for chicken, used to discourage the feather pecking and cannibalistic behaviour described in this bizarre but fascinating little Ministry pamphlet. Make a Meal of Cheese by The Cheese Information Service – a 1970s recipe book designed to encourage British consumers to use cheese in their cooking. Whilst the recipes have odd names, some of them sound pretty tasty (I’ll definitely be making ‘Savoury Welsh Surprise’ – leeks wrapped in bacon covered with cheese sauce). Others sound and look pretty revolting (peanut butter and cheddar biscuits, anyone?). ‘Once a week the local doctors used to give gas for their patients who were having extractions at the dentist’s, and we usually had to do half a dozen in the half hour which meant a fairly quick turn over, and hygiene was completely lacking… The face piece was all in one and the technique was to get the patient sufficiently far out so that all the necessary teeth could be extracted before he or she came round. This needed fairly precise judgement which only came with practice, and it meant that the dentist had to work as fast as he could. One with whom I worked longest was a really expert extractor indeed: he fairly whipped the teeth out, and he threw them wildly over his shoulder and made no attempt to do more than kick them under his bookcase before the next patient came in. I remember the look of absolute horror as a rather fastidious lady came in to have a tooth out and skidded on a bunch of recently extracted teeth which he had not had time to clear up’ (p. 49). On a final and slightly silly note, one of my wonderful volunteers came across this absolutely essential article in a 1950s issue of the magazine Country Fair. 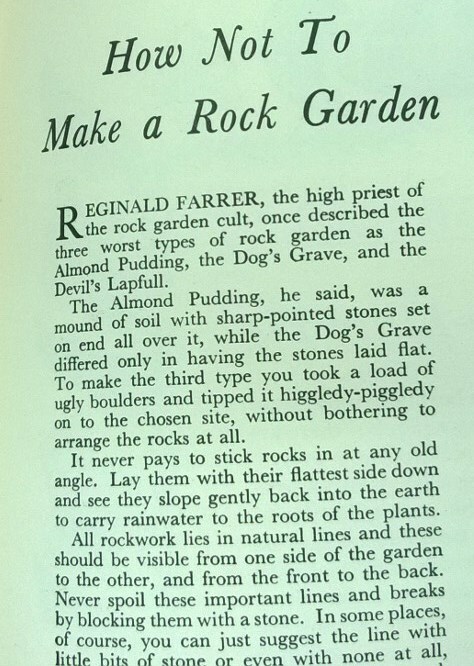 Who knew that there was a type of rock garden known as ‘the almond pudding’, or that the ‘devil’s lapfull’ type was regarded with such disdain? We’d love to hear about any books you’ve read about the English countryside that inspired you, or made you think, or made you laugh. Leave a comment here, or on our Facebook or Twitter pages. It was dark. I got up this morning and lit the wood burner, glad of my sweater, the brown one I was wearing to launch the ‘Sew Engaging’ project at the Riverside Inn on Valentine’s Day. It has a hole under one arm. I bought my sweater in Filkins two years ago, and have worn it practically every day since. I put another log on the fire and wash the soot off my hands; ‘Real stuff for real people’, time to search for a new sweater. Filkins lies just off the A361 between Lechlade and Burford and is home of the Cotswold Woollen Weavers. The village is of Saxon origin, now with a population of about 450, two churches built 800 years apart, a public swimming pool given by a Chancellor of the Exchequer, a village lock-up and a very fine pub. The area is home of the ‘Cotswold Lions’ or their modern descendants– flocks of woolly sheep. Cross the threshold of the Cotswold Woollen Weavers (mind your head) to feel the warmth of natural fibres and feast your eyes on their beautiful colours. The Main Shop is full of garments, accessories and knitwear; a visitor from Oxford adds a stitch to the needlework in the Weaving Shed. She has not heard of the Museum of English Rural Life but will visit when we re-open in 2016. 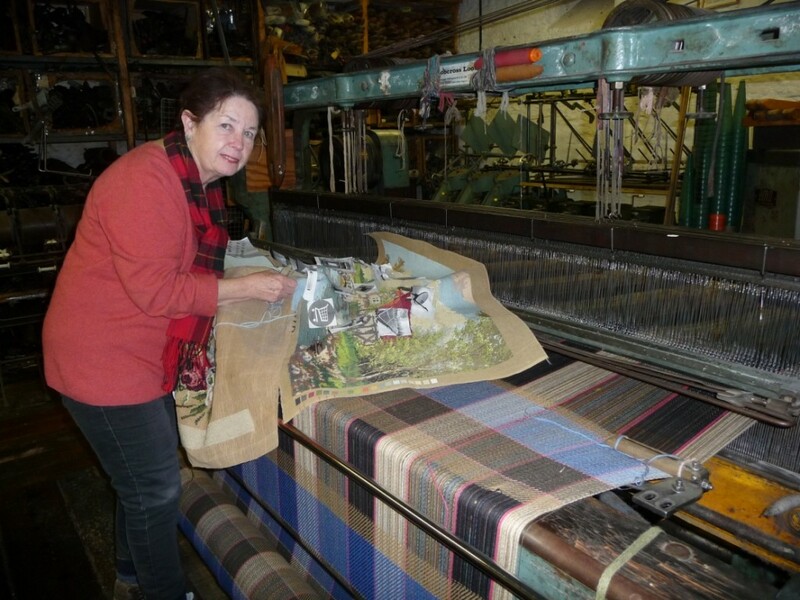 ‘The last of the looms’ – the fabric is now woven off site. 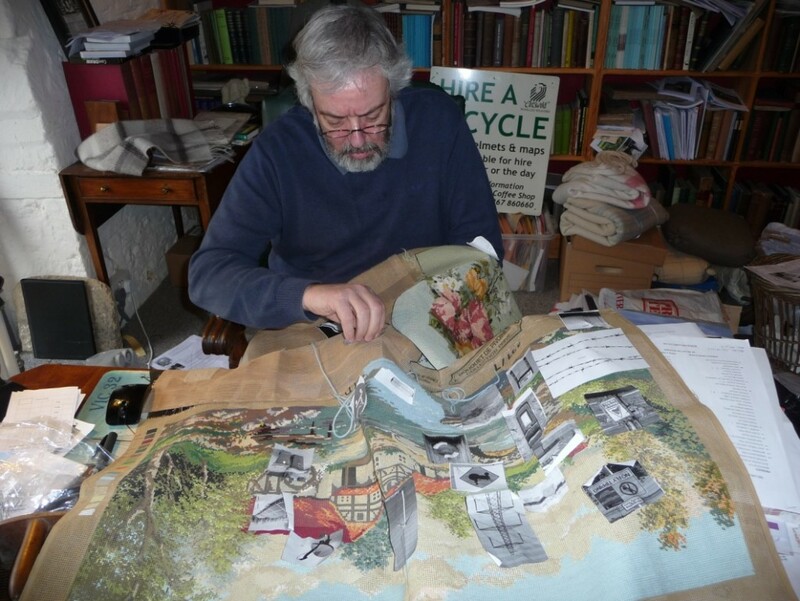 Director, Richard Martin, at his desk in the Design Studio, is surrounded by the ephemera of the textile industry. ‘What do you love or hate about the countryside?’ I ask. 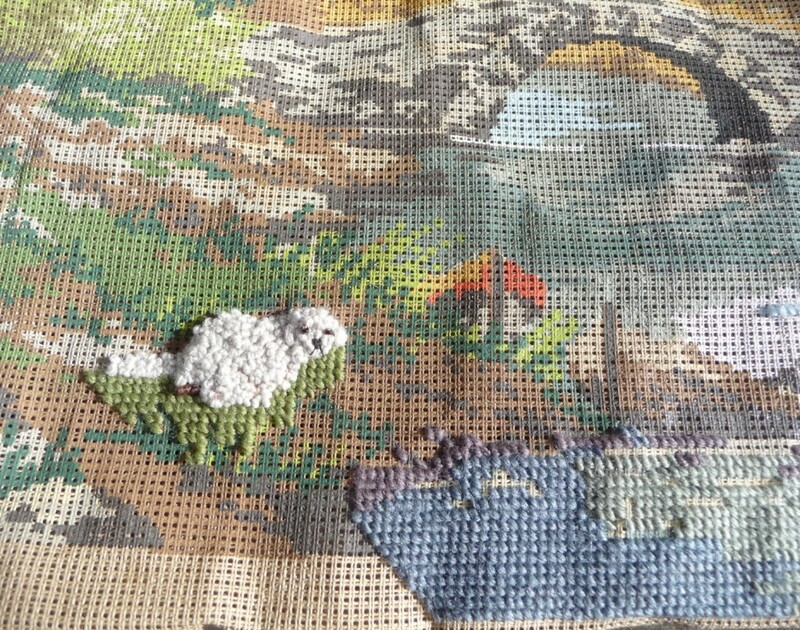 We talk about the project while he puts the first ‘man stitch’ in the ‘tapestry’. I make my purchase, leaving Richard making history, but there is no time to work more than a few stitches. I steal away via the coffee shop and come home. 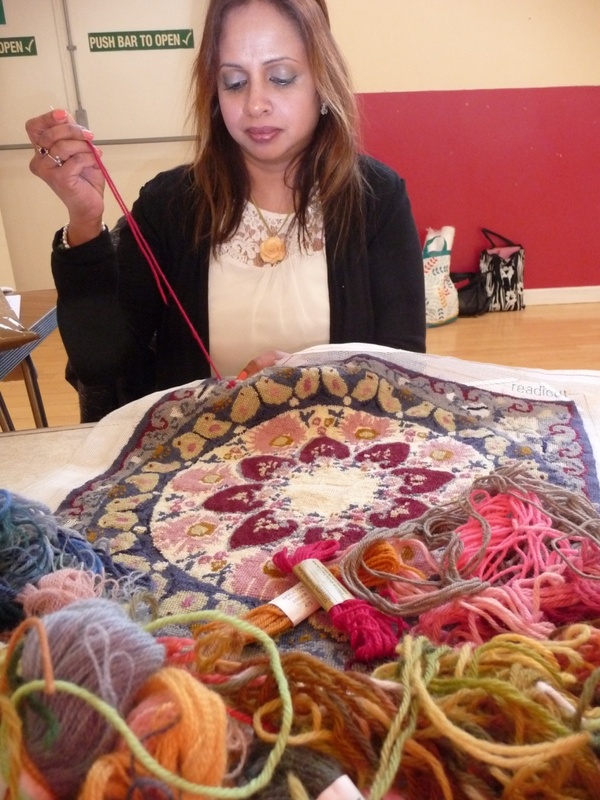 The ‘Sew Engaging’ project, funded by The Ashley Family Foundation, is giving people an opportunity to enjoy working with the ‘real stuff’- up-cycled needlework kits and a rainbow of tapestry yarn. Please contact Rob Davies at the Museum of English Rural Life if you belong to a group that would like to take part in the project. Previous sewing skills are not needed and we supply all the materials free of charge. 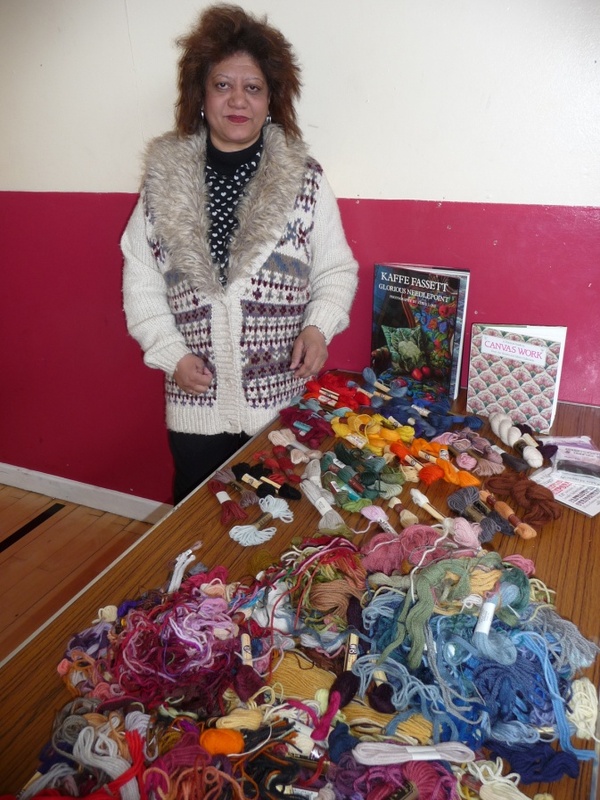 Next time, Jane goes to a Community Craft Fair in Slough. Alongside finalising gallery layouts, coming up with exciting ideas for interactive displays and filling in foundations for our extensions, our biggest update for you this week is the removal of our wagons from their monorail. We managed to finish the job in one day with the help of a specialist removal company, a fork-lift truck and much bated breath. If you haven’t been to the Museum before, for the last ten years we have had several wagons raised from the floor on a monorail running down the length of the galleries. Each wagon was attached to its own beam which was first removed from its supports and brought to the floor; once the wagon’s own wheels were supporting it, the beam was then lowered from the wagon itself and taken away. One main worry was that since the wagons have been off their wheels for so long, and their wood so desiccated from the dry atmosphere of our building, that they may be a little brittle when on the floor again. They all, however, came down without a hitch and are now waiting with the rest of the collection to be redisplayed. 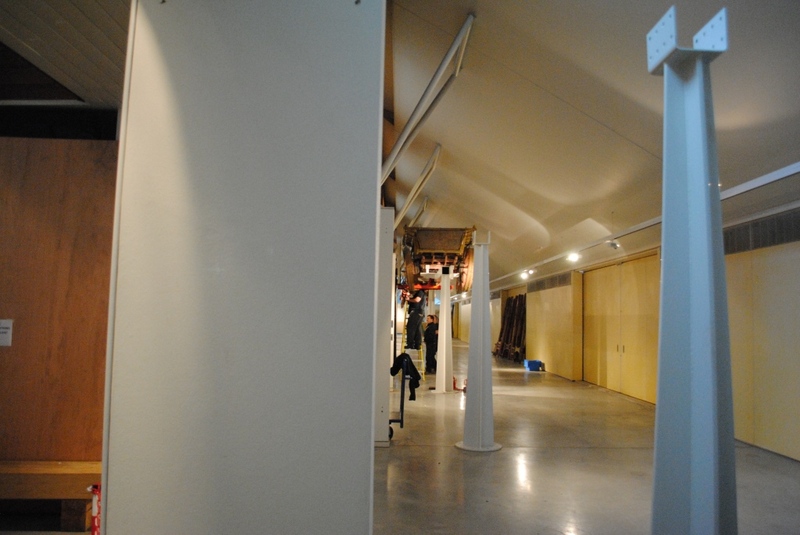 The reasoning behind their removal is that the wagons currently take up precious space in the rafters where we would like to build a new gallery for our ploughs. The Wagon Walk, where the majority of our wagons and carts will now be, will allow us to show our nationally important collection at its best. As well as exploring the craftsmanship and technical complexity of a wagon’s construction, we will also be delving into personal stories of those behind the wagons and how they used them. We will reveal how these wagons are intimately tied to their landscapes but also to local building traditions, and how the geography dictates the size, shape and construction of every single one of our unique wagons. Our Country Lives update: MERL goes to Stockholm - The MERL on Is the future of MERL ethnographic? Porridge Lady Anna Louise Batchelor is a Food Writer, Blogger for the Soil Association, Sustainable Food Advisor, Radio reporter & presenter, Cook and Freestyle Porridge Maker!